7 Tips For Choosing the Best Theme For Your WordPress Website | GUI Tricks - In Touch With Tomorrow! 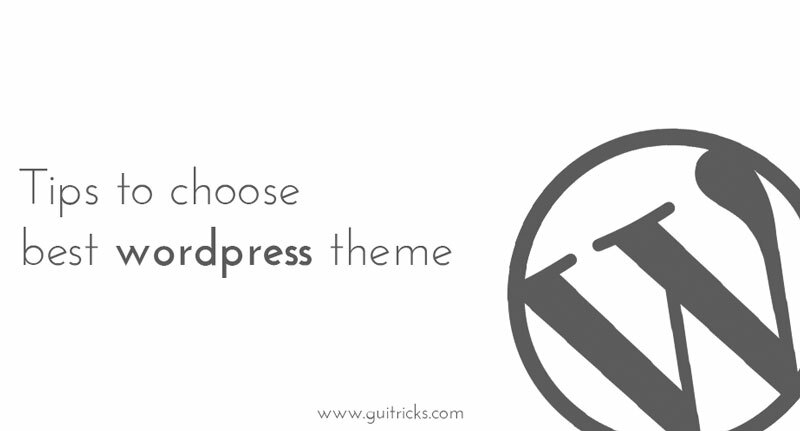 7 Tips For Choosing the Best Theme For Your WordPress Website - GUI Tricks - In Touch With Tomorrow! At the moment, 27 percent of all internet is managed in WordPress, reasons why this is so being quite numerous. First of all, WP has one of the easiest learning curves out there. Second, there is a myriad of plugins you can use for each situation and finally, the number of themes available is simply staggering. Some of them are free while others require a humble fee to be paid before they can be used. Regardless, one thing that both of these groups have in common is a fact that they completely alter the visuals and the layout of your website. Seeing how this is a major issue, here are few things to look out for when choosing the best theme for your WordPress website. In the world where there are more mobile than desktop users, you need a theme that is adjustable and responsive. Luckily, there is an easy way to check this. All you need to do is resize your browser screen and see if the layout adjusts to this new width. One of the strongest upsides of going with WordPress is a fact that most themes are quite responsive by default, however, trusting blindly in a theme you just discovered is never a good idea. Next thing you need to see is how compatible it is with different browsers. Sure, a theme may work flawlessly on Chrome, but what about the Firefox, Opera, Safari or Edge. How about users on older Microsoft operative systems who still use Internet Explorer. These are just some of the things you need to look out for. More importantly, you also need to check how your theme works with mobile versions of the aforementioned browsers. 3. Does It Support Your Plugins? Earlier on, we already mentioned plugins as one of the WP’s winning traits. In fact, some websites are extremely plugin oriented, alas, not all themes offer support to all plugins. Whenever you are not sure about this, it is always for the best to simply ask a developer in order to find out. Seeing how you are at the same time pointing out a flaw in their software, you will provide them with an invaluable insight and therefore do a favor to both parties. They sat that a picture can be worth a thousand words. Well, if this is true, by this analogy it would mean that a video is worth at least a million. In a world where 8 out of 10 users read only headlines, you need to find a more interactive, graphic and dynamic way to get a grip of their attention. What better method is there than using video? However, prior to resorting to this strategy, make sure that the theme you have chosen offers you a chance to edit and resize these videos adequately. Google’s ranking metrics are getting more and more complex. Factors like content and keywords have always had an impact on one’s search engine rank, but then things got out of hands. The abandonment rate and speed are these days just as big (if not bigger) and the choice of the theme matters as well. Because of this, you need to inquire into SEO friendliness of the theme you are about to use. Regardless of what visual style you want to go with, it is unlikely that a vanilla version of the theme you choose will have everything that you need. Because of this, you need to insist on customization. This usually includes things such as sites design, layout, adding images and of course, incorporating your company’s logo. Seeing how WordPress is extremely beginner friendly platform, keep in mind that you will make most of these alterations on your own, so why not make it as simple as possible. In the end, most of the above mentioned are not so easy to check before actually using the theme. In order not to make a mistake here, you may want to consult the opinions of others. All you need to do is look at the ratings and reviews of that particular theme left by other users. In this way, you can avoid making your own mistakes, by learning from the mistakes made by others. When put in seven steps, choosing an adequate theme may seem as a lot of work. Luckily, things always seem much more complicated on paper. In fact, all of this can be checked in under an hour (even if you are extremely thorough), which means that you will have a new theme installed in no time. Naturally, seeing how the nuances are what will make you stand out when compared to the competition, you need to take the consideration the industry you are in, as well as your personal preferences. This last part, however, is both subjective and situational. Steven Clarke is a WordPress developer Sydney based expert. In his spare time, he likes to write about his ideas and share them with the world. Steven is a regular contributor to several websites.